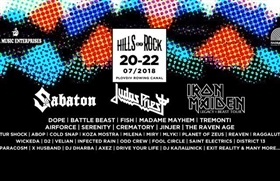 Hills of Rock is getting bigger! 14 new names have been announced to the second edition of the Plovdiv festival. Hills of Rock 2018 is taking place on 20, 21 and 22 July at the Rowing Channel in Plovdiv. Madame Mayhem, FISH, Battle Beast, Reaven and Kultur Shock are only some of the musicians joining the 2018 lineup. Some of the best bands from the Balkans are joining them as well - Planet of Zeus, Koza Mostra, Cold Snap, ABOP, Raggalution, MIRY, Млък!, Milena and Wickeda. Stay tuned for more information about the 2018 edition's lineup. The festival is taking place for the second consecutive year and is part of the Plovdiv - European Capital of Culture 2019's program.